With the 16x8 LED Matrix Shield we've doubled your project's matrix capacity by making it super easy to get two separate 8x8 matrices onto one handy board! Matrices like these are 'multiplexed' - so to control 64 LEDs you need 16 pins and to control 128 LEDs, you'd need 24 pins probably. Thanks to the MAX7219 driver chips that can control multiple matrices for you with only three control signals Data, Clock and Chip-Enable. 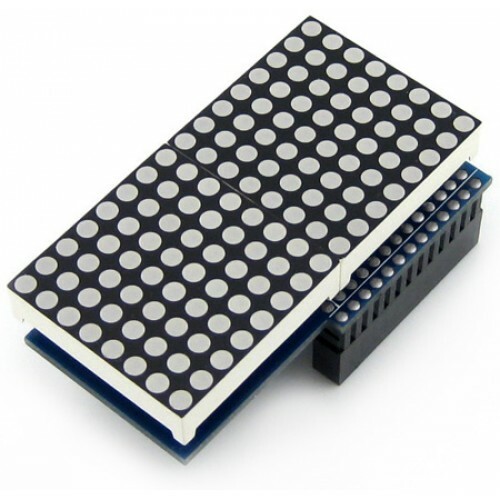 The LED Matrix Shield is also great for making scrolling displays. In our example codes, we set it up so words flow from one matrix to the other. Look at the demo video. All the components are pre-assembled. Just plug and play.